Tomatoes are fun to grow and, of course, exceptionally delicious to eat. We’ve put together some tips for supporting and pruning your tomato plants to ensure a bigger, better harvest. Whether you’re growing your tomatoes indoors or out, you’ll need to give plants the right type of support. Some tomatoes need more support than others. Indeterminate types (also known as vining or cordon tomatoes) grow to head height and beyond, necessitating tall, sturdy supports, while bush (or determinate) tomatoes grow up to about three feet or one metre high and therefore require less support. Falling in between are semi-determinate, or intermediate types of tall bush tomatoes. Cordon tomatoes can be grown against tall canes or stakes or, in a greenhouse, twisted around string. Firmly secure canes or stakes into the ground so they will be able to support the considerable weight of fruit-laden plants and withstand sudden gusts of wind. Push the supports into the ground before planting to avoid damaging the roots. Tie stems to their canes at regular intervals, leaving enough slack for the stem to continue growing in girth. Secure a tie just above a truss, as this will support the weight of fruits better than a tie secured below a truss. Use string or strips of soft material for the ties. Fully loop the tie around the cane before tying in the stem. String supports are easy to set up. Dangle string directly from the greenhouse’s framework, or from a horizontal length of string secured and stretched taut between the gable ends. Bear in mind that the greenhouse will be bearing the entire weight of the plants so it must be strong enough for the job, and the string must be stronger than average garden twine which can snap easily. Loop the string around the rootball of the tomato plant at planting time to secure the string in place. The string will be further anchored into the soil as the roots grow. As plants reach up, twist the string around the stem, completing a full loop around the stem every two leaves. When you reach a truss, tuck the string above or behind it, never below it. Cordon tomatoes can also be trained up a wigwam structure, one plant to each cane. In theory bush tomatoes do not need support, but left to their own devices plants can be weighed down onto the ground by heavy fruits, increasing the chances of slug damage, disease and fruit spoil. Tie plants to sturdy stakes to keep them from flopping over. Alternatively, secure two parallel rows of horizontal canes to short, upright stakes hammered into the ground. Plant the tomatoes in between the two rows of canes. Lift up the branches and drape them over the canes as they grow. Tomato cages offer fuss-free supports for bush and semi-determinate tomatoes. You can buy purpose-made cages, but it’s easy to make your own from concrete reinforcing mesh. The 6-inch (15cm) squares will allow you to easily flex the mesh into a tube to make your cage, and offer easy access to your tomatoes. They’re inexpensive to make, and can be reused for many years. Start by cutting a length of mesh five to six feet long (150-180cm). When rolled into a tube this will give a cage diameter of 18 to 22 inches (45-55cm) - tight enough to support a plant while giving it enough room to expand. Use sturdy wire- or bolt cutters to make the cuts, and wear gloves to protect your hands from snagging cuts. Once cut, carefully roll the length of mesh into a tube. Tie the ends together with heavy gauge wire or string to give a close hold. Now cut off the bottom wire from the cage to leave just the vertical wires sticking out. These wires can be used to push the cage into the ground. For added stability, tie the cage to a vertical length of rebar or similar sturdy upright. You can also pin the bottom wire to the ground with tent pegs. 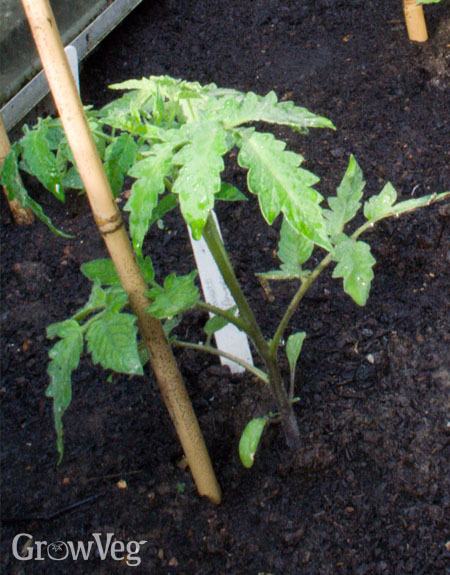 Position your tomato cage by lowering it over the top of a plant. Pull through any stray branches. As the plant grows, encourage growth upwards through the centre of the cage. Fruiting trusses can be left to grow outside of the cage to make picking even easier. At the end of the season simply unfurl the mesh and store flat to save space. Tomatoes require regular pruning for the best results. This includes pruning trusses to remove excess fruits, removing unproductive lower leaves, and removing sideshoots, or suckers. Removing developing fruits from trusses may seem counterintuitive but there are a few reasons to do this. First, thinning the fruits within the trusses of prolific fruiters such as cherry tomatoes will ensure those that remain grow larger. For varieties bearing particularly heavy fruits, such as the beefsteak tomatoes, thinning fruits to just three per truss will reduce the weight of the truss and make it less likely to snap away from the stem. Prune trusses by snipping off the fruits with sharp scissors while they are still small. Remove all leaves below the lowest ripening trusses of cordon tomatoes. These older leaves will divert the plant’s energy away from producing more flowers and fruits, while reducing air circulation and light penetration. Remove the leaves by pulling the leaf sharply up then down so it comes away from the main stem. Support the stem as you do this. Also known as suckers, sideshoots on cordon tomatoes distract the tomato from producing flowers and fruits, and must also be removed. Sideshoots appear at the point where a leaf joins the main stem. Remove them by wiggling them from side to side then using your thumb to snap them out. Remove sideshoots while they are still young, working from the bottom of the plant up. It needn’t take long to complete these simple training and pruning tasks - it’s a once-a-week job and at the same time you can inspect your plants and check on the progress of your ripening tomatoes. What system do you use? Drop us a comment below and tell us. "I live in southwest France Lot et Garonne and have grown tomatoes outdoors with fair success but my query is how far apart do you plant the young cherry plant apart? " "Hi Robert. Cherry tomatoes are generally best spaced about 60cm (2ft) apart." "I get confused about proper pruning...main stems and side shoots mostly but now this is the first time I've read about "trusses". Are those what the flowers grow on? Who has the time to prune suckers and trusses???" "The trusses are the flowers and fruits that follow. Pruning allows those fruits that remain to grow a little larger. It's by no means essential but does result in larger and arguably better quality fruits." "It would be helpful to have guidance on the height at which to sever the stems of cordon tomatoes - and whether this depends on the size of tomato to be grown (cherry, standard or beefsteak). Many thanks." "Hi Anthony. Barbara offers some excellent guidance on when to 'stop' cordon tomatoes: https://www.growveg.com/guides/should-you-thin-your-tomato-fruits/ Essentially, it's best to work back from your last frost date, counting back 10 weeks and then removing any flowers from this point onwards. This usually means around seven trusses of flowers are formed on cordon tomatoes before the top of the plant is 'stopped' or severed." "It seems like there are a ton of different ways you could use reo mesh. You can do things to help you grow your tomatoes better, you can use it as a structural support, there are even people who use it to decorate! I think when we have things that versatile then there must be something good about it! " "Absolutely Pam - it's incredibly versatile stuff!" "I find when using the concrete reinforcing mesh where the tomatoe plant touches the wire it dies off any suggestions?" "I wonder if anyone has made a comparison between yield when grown in pots versus yield when grown in grow bags ? If anyone is interested I am running a comparative trial starting next month. Anthony Boyd"
"Hi John. I've never experienced this - it could be that the mesh is getting very hot?" "Hi Anthony. We'd love to hear how your trial gets on - please let us know the results once you have them." "Will be happy to Regards, Anthony"
"Where do you get your reinforcing mesh from? I can't find anything with spaces greater than 2" online. Thanks"
"I bought it online from Amazon. If you look for cattle panels, that should help. Alternatively you could go to a home improvement store and look there. I had some trouble sourcing suitable mesh here in the UK. In the end I actually cut through the wire to make the squares bigger than 2 inches. If you are in North America, it should be much easier to source mesh with bigger squares." "Ben, thanks for the suggestion. We live in Notyhumberland so I'll try one of the local farming suppliers. Tim"